Kenya should learn from Somalia the meaning of national pride. 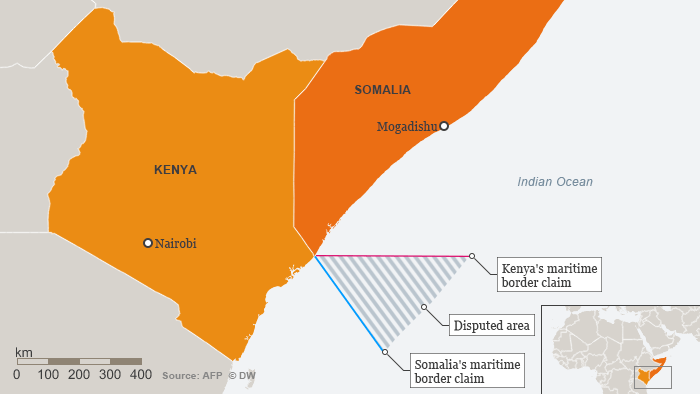 According to the AFP, Somalia argued that the maritime border should extend Southeast, in an area equidistant between the two states, while Kenya believes the line delineating water in its control should continue directly East. While it is maritime borders that make up the legal filing, the real issue between the two countries is oil and natural gas exploration. Interest in Kenya for oil and gas exploration has been drummed up in recent years. According to a report by global financial firm KPMG, as recently as late 2012 Kenya had no proven oil or gas reserves. This changed when London-based multinational Tullow Oil reported discovering crude in the country’s Northwestern Turkana region. Since that time the country has licensed exploration and development could begin in the next few years. In addition to inland oil reserves, exploration has turned to the country’s vast coastline. Kenya recently opened eight new geographic blocks for sale to corporations to explore and develop. According to to Reuters, seven of these new blocks lay within the disputed water. Not only does the contested ownership threaten to dissuade corporations from potential investment and exploration, it could put the contracts that have been previously signed between Kenya and multinational corporations at risk. The article allows for three potential exceptions to the rule. For Somalia’s part, the country alleges that neither a historic title nor other special circumstances exist to negate the general rule. Kenya is yet to respond and has not indicated how it will, whether it will present evidence of historical title or special circumstances. The imperialists left Africa divided in straight lines, with those lines come water disputes. For Kenya, here, the boundary lies line parallel to the line of latitude. That gives Kenya the larger share of the maritime area and it has already sold mining licenses to international companies. But Somalia disagrees. The Somalis want the boundary to extend to the southeast as an extension of the land border. Somalia wants the International Court of Justice, which is an organ of the United Nations to define the boundary as laid down by the United Nations Convention on the Law of the Sea and other international sea laws. Being a law grad myself, I think Somalia legally has a case, but neither the UN nor the ICJ have been able to help this situation! What lies beneath these waters and the brave Somalis have been protecting is fish.. plenty of it in the sea. Plenty of it to feed Somalia, loads of it to fight poverty and famine, but it’s the territorial disputes that are ruining the country…. Britain and other Western powers haven’t helped the situation, they’ve purposely been dumping uranium waste in the waters to destroy Gods blessings… food. Listening to Kenyan President, Uhuru Kenyatta, my heart naturally bleeds. As it’s human beings who will be suffering in Kenya more than anything. However, President Uhuru Kenyatta is a part of the problem. I’ll tell you why. Somalia has been fighting extremism, although great successes have been achieved, Al Shabaab still operates despite American drone strikes by President Donald Trump. According to the Investigative Beuru of Journalism, strikes have increased under Trump, however, we all know what America is doing is illegal. Because, they are fueling the fire. The root cause of the problem should be addressed and that is, who is funding the Al Shaabab movement. In recent years, al-Shabab has increased its reliance on smuggling contraband sugar across the border into Kenya, bringing in tens of millions of dollars annually. Kenyan forces have been accused of involvement in the scheme since 2015. According to United Nations, Al Shaabab has been making money from the illicit charcoal trade, I am enclosing a link to the UN document in the descriptions section. Most of the deals between Al Shabaab have been winning is from UNITED Arab Emirates and no doubt the Saudis have helped through ideological support.